And what, exactly, is a Bagel Hound? Well, my friend, I'm glad you asked. Picture a dog the perfect size for apartment living, blessed with the intelligence and good humor of the Beagle and the life's-for-living, late-afternoon-in-the-sun activity level of a Basset Hound. Walkies? Sure, that's great, grab the leash, off we go, a world of scents before us... but you say The X Files is on tonight? Well, shucks, just grab that popcorn and settle into the corner of the couch. Mind if I join you? Affability is the Bagel's middle name, "Hidy-ho, neighbor - got a cookie?" his motto. 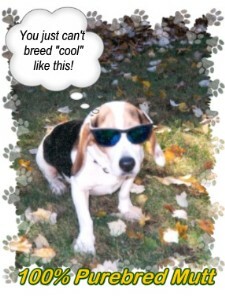 In short, a Bagel Hound is God's Gift to Hound Lovers - two fabulous breeds rolled into one. 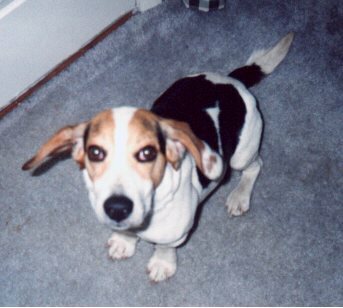 Now meet Quentin, the Bagel Hound... part Beagle, part Basset, 100% All American hound dog. The nose knows! A shelter refugee from the New Fairfield Animal Welfare League, Quentin was found wandering and malnourished in rural Connecticut, without collar, tags, or family to love. Now, Quentin (also known as Q, Q-man, and Quent) lives with a 6th grade teacher and two feline brothers. He's also been appointed Honorary Class Mascot of Ms. S's 6A Language Arts classes - "Where The Red Fern Grows" is his addition to the curriculum! Tail-wags and aroooo's to all the cyber-beagles out there... and if any Beagles, Bassets, or Bagel Hounds stroll across this page, feel free to drop us a line! We'd love to recieve .gifs and .jpgs of all our fellow cyberhounds to add to our page! Aroooo! Like the images you see here? Here's where we got 'em!